Polyscias balfouriana, commonly known as, Balfour Aralia is a beautiful foliage plant known for its attractive leathery foliage. 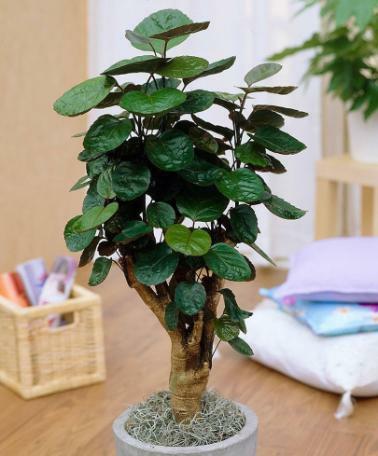 Though a bit hard to find in horticulture marketplace, it makes an excellent indoor plant that does not require much maintenance. Originally from tropical regions of the Pacific, can be grown in bright and slightly humid spot near a sun exposed window where it receives plenty of indirect sunlight in the morning and occasional watering. The plant is characterized by round, leathery, dark green leaves that look like dinner plates thus giving the plant its common name – the Dinner Plate Aralia. Variegated varieties of Balfour Aralia with gold and cream leaf margins are also available. In its native climate, it grows up to 12 feet or more but it takes many years to attain that size. 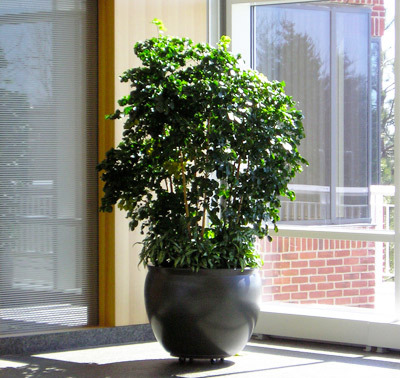 When grown indoors, it grows slowly and can be easily pruned and trimmed to keep it in desired shape. In fact, Balfour Aralia makes an excellent subject of bonsai. Balfour Aralia benefits from a well-drained soil and occasional application of nitrogen-rich fertilizer. The plant is prone to root-rot when over-watered therefore it is advisable to neglect on part of watering. Water generously when the soil is completely dry and then allow the soil to dry before next watering. For healthier growth, make sure that your plant receives at least 2-3 hours of indirect morning light. A good shower to keep the leaves clean is also advisable. Polyscias ‘Fabian’ (Fabian Aralia) grows scalloped dark green leaves on a woody trunk. Polyscias fruticose (Ming Aralia) grows feathery leaves and makes a nice small tree for growing outdoors. Alert: The leaves of Balfour Aralia are poisonous for pets.